Help Save the Museum of the Confederacy! Deadline December 23rd! We have believed from the beginning that our effort would likely come to a conclusion by the end of the year, give or take a few days or weeks. The effort to prevent the completion of the merger of the Museum of the Confederacy and the Museum at Tredegar (as well as, to a lesser extent, the Virginia Historical Society) is now coming down to the wire. Our new deadline is 23 December. If the MoC is to be saved, it is up to us, the SCV. We have asked the UDC (national organization) to join us, but they have declined. Although they have expressed some sympathy for our effort, they have rejected our appeal and elected to follow their own path, even though they know that path will not yield any results. In addition, we have asked the Military Order of the Stars and Bars for assistance. They, likewise, are sympathetic and, at this writing, appear to be leaning toward offering some financial support, but if they do, it probably will not arrive before the 23rd. Therefore, I urge, indeed, I beg you to join the Virginia Division and the General Executive Council with pledges of significant monetary donations before 23 December. I fear I have not adequately reminded everyone in general and you in particular, that this fight is not just for the benefit of the Virginia Division. When the Confederate Memorial Literary Society was founded, it was set up to be managed by a board of regents composed of two representatives from each Confederate state. If each Division could now make a donation allowing us to ask the Richmond Circuit Court, then the Virginia Supreme Court of Appeals to prevent the completion of the merger, we hope to return the management of the MOC to Confederate-friendly hands. If you have any questions, please don’t hesitate to contact Edwin Ray at 804-517-6587 or JRAY250443@AOL.COM. This entry was posted in Uncategorized on December 14, 2014 by scvpacnw. Pacific NW Division News! Constitution adopted and newsletter started! At the Pacific NW Division Convention, we officially adopted a Division Constitution and Bylaws. Please follow the link below to view the Constitution and Bylaws. We will be publishing a Division newsletter in the next two weeks. 2015 is going to be an exciting year for all of us! Check back on our site often for updates. Please feel free to add articles and comments. This entry was posted in Uncategorized on December 8, 2014 by scvpacnw. WASHINGTON (Reuters) – The U.S. Supreme Court on Friday agreed to weigh in on whether Texas officials should have approved a specialty license plate that displays the Confederate flag. The case raises the issue of how states can allow or reject politically divisive messages on license plates without violating free speech rights. The Texas division of the Sons of Confederate Veterans Inc said its members’ free speech rights were violated when the state, which has a program that allows groups to suggest messages to be used on specially designed plates, declined to approve the plate. 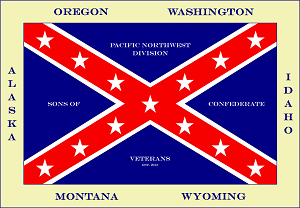 The proposed design featured a Confederate battle flag surrounded by the words “Sons of Confederate Veterans 1896.” The flag, synonymous with the states that fought to secede from the United States in the U.S. Civil War, is a blue cross inlaid with white stars over a red background. The legal issue is whether messages on state-issued license plates represent speech by the government or an endorsement of a private message. The latter constitutes “viewpoint discrimination” and is a violation of the First Amendment of the U.S. Constitution’s guarantee of freedom of speech. The New Orleans-based 5th U.S. Circuit Court of Appeals said Texas officials did not have grounds to reject the Confederate plate. This entry was posted in Uncategorized on December 6, 2014 by scvpacnw.